TemplateHack.com - Download BMag V 2.1.1 template blogger premium. 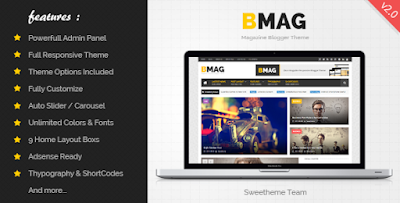 BMag is a Magazine Responsive Blogger Template, this is a professional designed Blogger Template that is very clean and compatible with many platform. It is perfect for creating your favorite magazine or blog using blogspot platform, there is no need to write any code to customizable by every person including newbies. 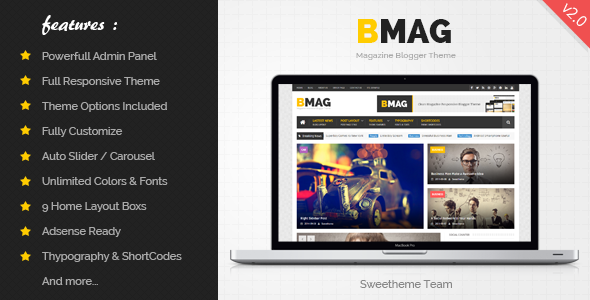 B MAG Responsive Blogspot Template provides a very powerful admin panel that allow it’s users to easily customize each and everything with easiest theme options to use. It also support RTL / LTR functionality, that’s mean now you can change theme direction from your favorite panel just by changing language and then also can translate word to your own language. B Mag Magazine Blogspot Template is 100% Search Engine Optimized, that’s mean it is ready to help you get higher ranking because of Best SEO practices we used in this design. If you are already impatient and interested in BMag V 2.1.1, please click the button below.